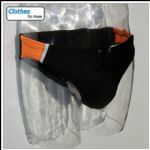 We are offering a large range of swimming briefs for men. Several styles are available including briefs with narrow sides for that extra European look. Men will find something appealing in this swimwear collection including animal print swim briefs consisting of leopard and tiger print, camouflage print and a wide selection of plain and bright coloured briefs for men to choose from. If you like this style of Speedo swimwear then we are certain that we have something here for you. Our swimwear designer has created every swim brief in this range and we are proud to offer you an item of swimwear that will enhance your swimming experience and ensure that you look great when you are sun bathing. 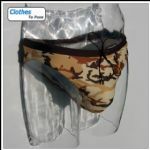 An Australian term for this item of swimwear is sometimes referenced as “budgie smugglers”. In the UK we prefer to call them swim briefs or Speedos. All of the swim briefs available here today have been designed around the popular style known as Speedo swimwear. If you are visiting or living in France, you might know that some public swimming pools do not allow men to wear any style of swimwear other than Speedos or briefs as we like to call them in the UK.